I have to be honest...I grew a hatred for most sports games. I got so tired of the EA Sports franchises because it just seemed overkill but I understood a new season meant a new roster and new video game version...aspects I never cared for. I loved the core of sports games and could have cared less about highly paid players and there names. And I tried to avoid the RS series of sports games but took a chance on them. I'm glad I did. They captured the heart of the sport they are portraying. RS Soccer and Tennis on the 5200 are fun and very challenging. Football on the 5200 is not bad. The 2600 RS sports games are good, too. BLAST THOSE PESTS!! Congratulations kamakazi20012! This was our 52nd Squad Challenge and our first 5200 Squad Challenge so far! We only had two participants for this Challenge but the enthusiasm here was great! @kamakazi20012 posted a score of 39,194 and @RickR was close behind with 20,631. Thank you to you both for turning out for this game! 2019 will be changing it up in High Score Squad with new challenges for Lynx, SNES, Genesis, Master System, Atari ST, Jaguar, 5200, TurboGrafx-16, Intellivision, ColecoVision, and much much more, in addition to the usual lineup of video game systems. We may even have an Arcade challenge! Be ready to play all of these game systems, we'll be breaking new ground with more interesting Squad Challenges coming up very soon and throughout the year, and we hope to see you there. Way to go everybody! Well I did give it a bit of a go but, 1, my scores were so abysmal I never snapped a pic. Barley cleared the first screen. Then I found myself busy with other projects that the time slipped away without my notice. K's score of 39k is amazing to me. I played for hours at a time and always topped out right at about 19k. I was in some sort of a trance when I made 39,000 points. Then the spider got me and killed my mojo. 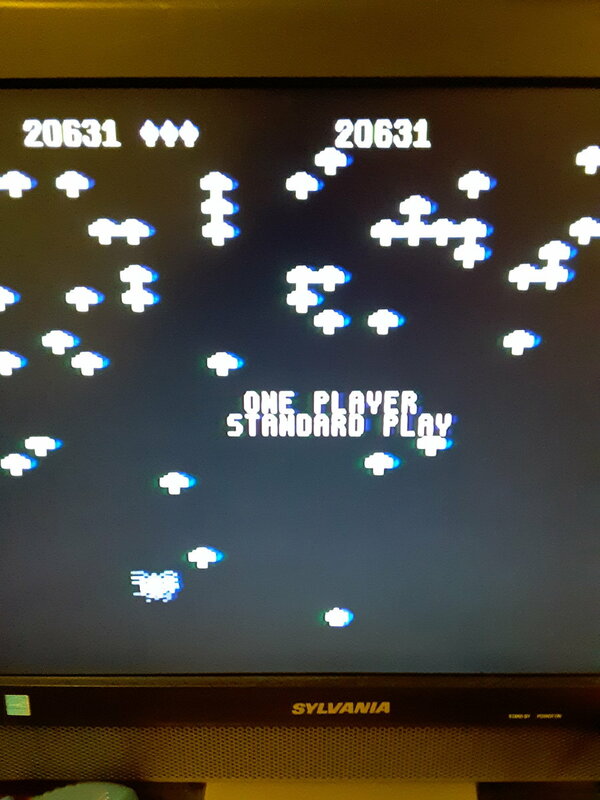 I have to admit I'm not a fan of Centipede. This was Mom's game...not mine. I was more of a Space Invaders, Joust, Pole Position person. I'd rather play Super Breakout instead. However, I really admire 5200's Centipede at the same time because it has a distinctive charm about it. It's visuals, controls, and sounds are closer to the arcade than most other ports. I do have fun when I play it. I just hate that damn spider! Instructions say to pay attention to game sounds. But once you hear the spider it can be too late. A split second is all it takes for Spidey to fly in from either side and land on your wand. He has no pattern. But that is part of what makes it fun. Thanks guys for the kind comments. I wanted to play more but my controller needs new parts. One tip I kind of discovered is to keep your wand in the middle of the screen as much as possible. The spider can't surprise you there. But that can be difficult when the centipedes make it down to the bottom. And even then, the spider can still get you if you don't dodge fast enough. I found this game to be very frustrating. For most games, I usually get a little better the more I play. But not this one. I plateaued very quickly. I did learn to appreciate the 5200 reset button on the controller though. I ended up using that a lot. I used that button the most as well. I'm surprised at how many IO members lack a 5200. Is it really that misunderstood or just hard to get? I'm not sure. I know a lot of members here have a 5200. I also spread the word on a few 5200 Facebook groups. It could be the Chas10e case...maybe they tried but didn't feel like posting a score. I still say that there is no such thing as a bad score. The whole point is to have fun. Then again, if other 5200 owners ran into controller issues like I did then I can understand the lack of participation. That's why I use my 5200 often. It keeps it working longer without issues. Letting it sit ruins the controllers. I didn't even have a chance to play the game to participate! Work has been crazy! Work triumphs gaming. Maybe Justin will do this one again. Everybody needs a six month vacation twice a year. I wish my mother was around for this. I know she'd have whipped both our butts. I never could touch her score. She wasn't much of a gamer as far as learning every game but Centipede? Man, she owned that game. There's often times that spider will jump out, stay on one side or another, and just jump up and down tempting you to try to come close to it. Then you do and BAM!...your spider food. 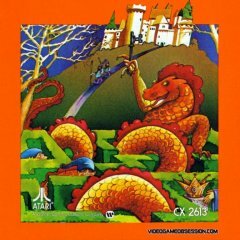 Awesome game and it was a blast to revisit 5200's Centipede. It's back on the shelf now and I probably won't play it again until the next 5200 Centipede HSSC.